What are Spoken English Errors? Everyone communicate in his own way which is comfortable to them. 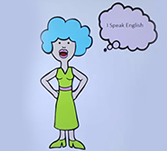 While speaking confidently and effectively, one should be aware of the common mistakes in English language. This tutorial is intended to give tips and tricks that will make sure of non-native English speakers to find out basic errors in speech. By avoiding them in speaking, it benefit them strongly, more employment opportunities and unproductive business. Some face issues while speaking in public and without having knowledge on what they are speaking they face trouble. This tutorial is for those young professionals who need help in finding the mistakes out of English speech. One should be open minded to ask the right questions and get their specific answers on the topic before proceeding with this tutorial.